The cyclical boom-to-recession nature of the economics of cocoa supply is a major problem for the international cocoa industry - and especially for countries whose economies depend on cocoa exports. Only through an understanding of the dynamics of cocoa cycles can policy decisions be made through the various phases of supply cycles. Based on a major international cocoa conference, this book presents seventeen edited papers from leading experts, making a major contribution to that understanding. 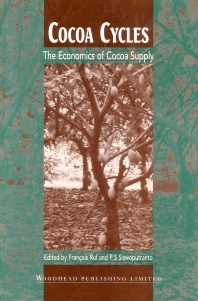 It explains the powerful economic, social and political factors which impact on the cocoa economy. It shows the laws of cocoa supply are closely linked to environmental, ecological and institutional factors. From ‘Forest Rent’ to ‘Tree Capital’ basic ‘laws’ of cocoa supply; The role of speculative activity in determining international cocoa prices in the New York futures market; Cocoa harvest shortfalls in Bahia, Brazil: Long and short term factors; Regeneration of cocoa cropping systems; The Ivorian and Togolese experience; Land pressure, farm household life cycle and economic crisis in a cocoa-farming village; Cocoa smallholders facing a double structural adjustment in Cote d’Ivorie; The present cocoa crisis and its impact on protection of cocoa crops against pests; Cocoa production in Cameroon; Prospects for Ghanas cocoa industry in the 21st century; The shifting of cocoa production areas in Nigeria; Prospects for the cocoa industry in Equatorial Guinea; The cocoa crisis and land reform in Sao Tome’e Principe; Ivorian and Malaysian supply; The economic complementarity of cocoa and coconut intercropping; Government policy and smallholder changes in sustainable tree crop development in the tropics; Farmer strategies and Agricultural development; The spectacular efficiency of cocoa smallholders in Sulawesi.